Preheat oven to 350*F. Butter or spray a 9-inch springform pan and wrap the bottom in foil to prevent any spillage. Set aside. Melt chocolate and butter together in a heatproof bowl over a pot of simmering water, or in the microwave, stirring until smooth. Set aside and let cool slightly. In a large bowl, whisk together the egg yolks and 1/2 cup of the sugar until pale in color and thick. Stir in the melted chocolate, the almond extract, the almond flour and salt. In a separate bowl with the whisk attachment on the mixer (or if you brave you can whisk by hand), whisk together the egg whites and the remaining 1/2 cup of sugar until soft peaks form. Fold 1/3 of the whipped whites into the chocolate mixture with a spatula until white streaks remain. Fold in the rest of the egg whites until combined. Pour batter into the springform pan and spread evenly. Bake in preheated oven for 35-40 minutes. The cake will be set on the edges and slightly jiggly in the middle. Allow to cool for 30 minutes or so on the counter, then transfer to the fridge to allow to set for at least 3 hours. Sift cocoa powder over the cake before serving slightly chilled. I recommend making one cake flavor at time, starting the second once you have released the first from the cake pans to finish cooling. Both cakes will need a preheated 350*F oven and two 9-inch cakes pans which you have greased with cooking spray or butter. Stir together the milk and vanilla and set aside. Mix together the flour and baking powder and set aside. Beat the butter and sugar together until light and fluffy. Alternate adding the flour mix, then the milk mixture (as Flour + Milk + Flour + Milk + Flour) and beat on low, if using a stand mixer, until just blended. Beat the egg whites until you reach stiff peaks. Gently fold the whipped egg whites into the cake batter. Pour the batter evenly into each of the pans. Bake at 350*F for 23-25 minutes or until a toothpick inserted into the middle comes out clean and the edges have just pulled away from the sides of the pan. Remove from the oven and allow to cool in the pan for 10 minutes. Turn out onto a wire rack and allow to finish cooling. Mix together the milk, oil, eggs and vanilla in a big bowl. Add all of the dry ingredients and mix together until well combined. Add the boiling water slowly and mix until smooth. Pour batter evenly between two greased pans. Bake for 30-35 minutes or until a toothpick inserted into the middle of the cake comes out clean and the edges have slightly pulled away from the sides of the pan. Remove from oven and allow to cool in pans for 10 minutes. Turn out onto a wire rack and allow to finish cooling. Bring the heavy cream to a simmer in a heavy bottom pot over low-medium heat (you want to just start to see bubbles around the edges). Remove from heat and pour over the chocolate chips. Stir slowly until smooth. Beat the softened butter in a big bowl until creamy. Add the sugar, cream, vanilla and salt and continue to beat until light and fluffy. With a stand mixer this will take a full 3 minutes on high speed. You want the volume to increase slightly. If the frosting seems too thick add a touch more cream, or if it's too thin, a little more powdered sugar. Level the tops of each cake layer with a serrated knife before you start. 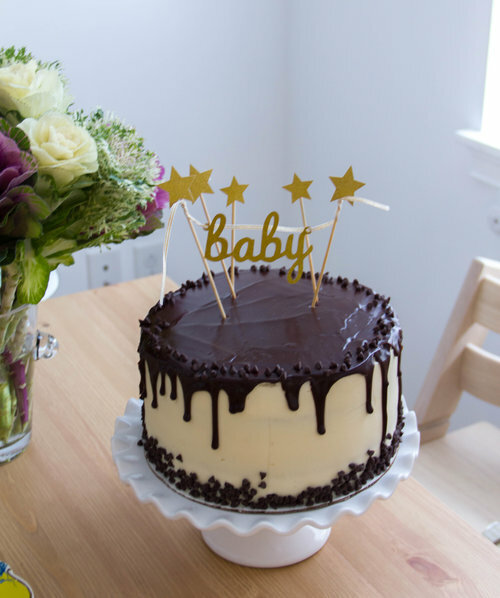 Place one chocolate cake layer on a cake stand or serving plate. Fill a piping bag (or ziploc with a corner snipped off) with about half of the vanilla buttercream. Squeeze a ring of buttercream along the edge of the first cake layer. This ring will prevent either of the fillings from spilling out and changing the color of the outer frosting. Fill this first ring with a couple of tablespoons of the raspberry preserves. Spread evenly to the edges of the frosting. Next place a vanilla cake layer on top, being sure to stack evenly to prevent a leaning cake. press down very lightly to ensure contact of the layers. Using the piping bag, create another frosting ring along the edges of this layer. Fill with a couple of tablespoons of the chocolate ganache and spread to the edges of the layers. Repeat with another layer of chocolate cake and raspberry preserves, then top off with the final layer of vanilla cake. Frost the top of the last vanilla cake layer and the sides of the whole cake with a thin layer of buttercream. You will only need a thin layer at this point to lock any stray crumbs. Once you have that initial layer on, place in fridge for 15 minutes. 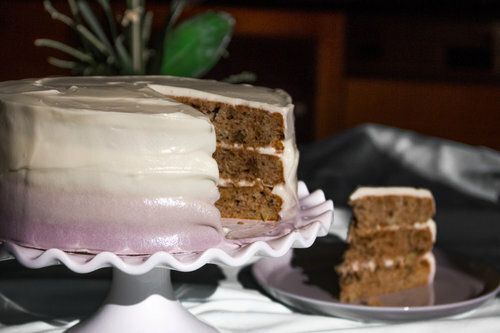 Remove the cake from the fridge and finish frosting with the remaining buttercream, smoothing out the sides and the top with the flat edge of your spatula. Return the whole cake to the fridge for at least 30 minutes. At this point you should still have some of the chocolate ganache from the filling remaining. Add 1 tablespoon of cream to the left over ganache and melt in the microwave for 15-30 seconds. It should be more liquified or drippy than the consistency of the filling, but NOT piping hot. Remove the cake from the fridge. Using a spoon, drizzle some of the warm ganache onto and slightly spilling over the edges of the cake to create the dripping effect. 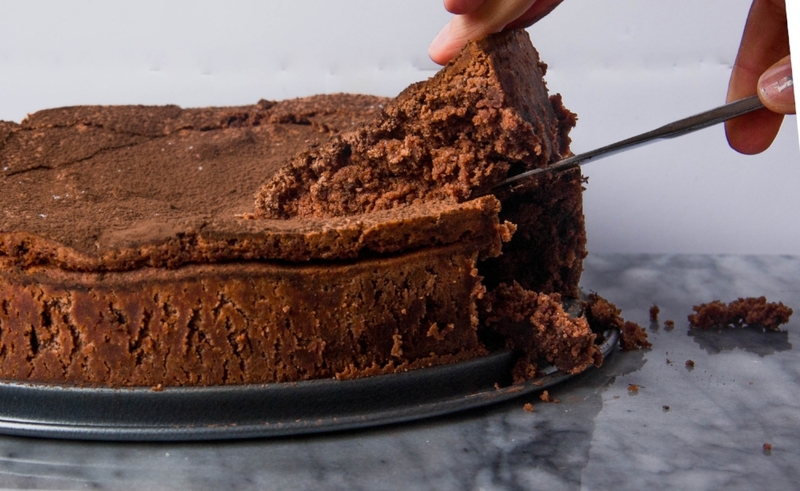 Finish by pouring the remaining warm ganache into the center of the top of the cake, and smooth with an offset spatula, pushing to the edges to connect with the drips you just created. It is ok if a little more spills over the edges. Finally, sprinkle some of the left over mini chocolate chips over the top and onto the sides and bottom of the cake (this part is optional). You can refrigerate the cake at this point, but be sure to remove at least one hour before serving to bring back up to room temp. You can also freeze any remaining cake wrapped tightly in plastic wrap and a freezer bag for up to 2 months. Defrost overnight in the fridge and remove one hour before serving. Thin slices of blood oranges to top the almond cake. Zest half of one of the oranges and set aside, then slice all into thin rounds (I ended up using about 2 ½ oranges, but this will vary depending on size of oranges and slice thickness). In large sauce pan, stir together water and cup of sugar. Set over low-medium heat and allow sugar to melt (the syrup will become clear when the sugar has dissolved). Add the slices of orange to the pan, aiming for a single layer if possible. Turn heat up to medium-high and bring to boil. Turn down heat slightly and allow to simmer for about 15 minutes. The rinds will have started to become slightly translucent. Remove the orange slices from the syrup and place on parchment paper to allow to cool. Keep syrup on heat for another 2 minutes to allow it to thicken just a bit more. Preheat the oven to 350°F. Grease a 9-inch cake pan. Pour a little of the reduced syrup in the bottom of the pan and arrange the cooled orange slices to cover the bottom completely. A little overlap is OK.
Stir together the melted butter, the greek yogurt, and the 1 ½ cups of sugar until well combined and a nice creamy white. Add the almond extract and reserved orange zest. Mix in the eggs one at time, stirring well after each addition. Finally, mix in the flour and salt mixing until just combined. Dollop the cake batter over the oranges in the pan, then smooth into a nice even layer (this will prevent the oranges from potentially pulling up from the bottom of the pan). Bake for 35-40 minutes. The top will brown and a toothpick inserted into the center will come out clean. Allow cake to cool in pan for about 10 minutes. Run a knife around the edges to help release, then using pot holders or a kitchen towel to protect your hands from the residual heat, invert the cake onto a plate. You can gently tap the plate with the inverted pan on top on the counter to help with the release, but this shouldn’t be necessary if you greased the pan well (I recommend using butter for this recipe instead of nonstick cooking spray). If you have leftover syrup, you can brush this on to the top to add some extra shine and color. Allow cake to cool completely before serving. Enjoy! Beat the eggs together until thickened and pale in color (if using a stand mixer, the paddle attachment is perfect). Slowly add the sugar to the eggs, turn mixer to medium-high and continue to beat for another 4-5 minutes until the eggs are light and fluffy. Add the vanilla, lemon juice, and zest and beat until just combined. Gradually add the flour mixture on a low setting and stir until just combined. In a small saucepan, heat the milk and butter until butter is just melted and milk is hot. You are not scalding the milk so do not allow to boil. Swirling the pan will aid the butter to melt. Add the liquid to the rest of the cake batter and stir until smooth. The batter will be thin. Pour into the prepared cake pans, distributing evenly between to the two. Lightly tap each pan on the countertop to remove some of the bubbles from the batter. Pop each pan into the middle rack of the preheated oven. Bake for 30-32 minutes turning once to ensure even baking. A toothpick (or if you are like me a butter knife) inserted into the middle of the cake should come out mostly clean, and the cake will have started to pull away from the sides of the pan. Allow to cool then cut each cake into two layers. Beat the room temp butter with the paddle attachment on high until light and fluffy. Turn to a low speed and gradually add the sugar. Once the sugar has combined with the butter and returned to a fluffy texture, add the honey, yogurt and vanilla extract. Continue to beat on a medium-high speed for just a few minutes until all the ingredients have combined and the frosting looks smooth. This will be enough frosting for a 4 layer 9-inch cake with frosting between each layer, a crumb coating, and the finish frosting. You may have some left over, depending on what your frosting to cake ratio preference may be!! I used about 2/3 of the recipe above to get the result below. 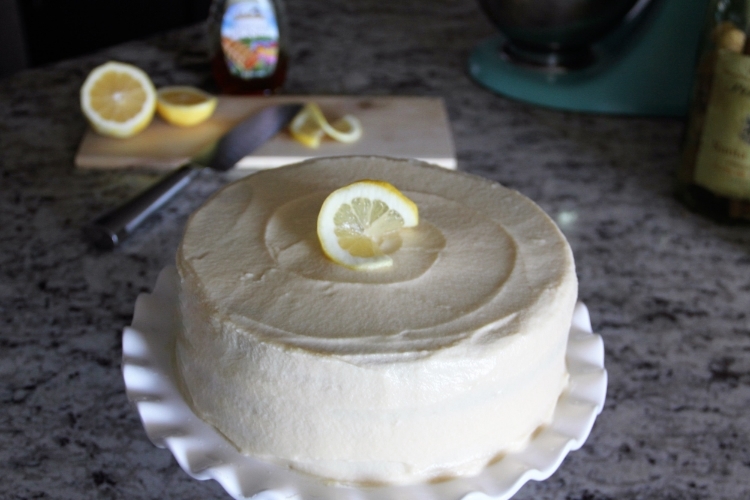 The taste-tester slice of the lemon cake... just enough of the honey buttercream frosting for my liking!